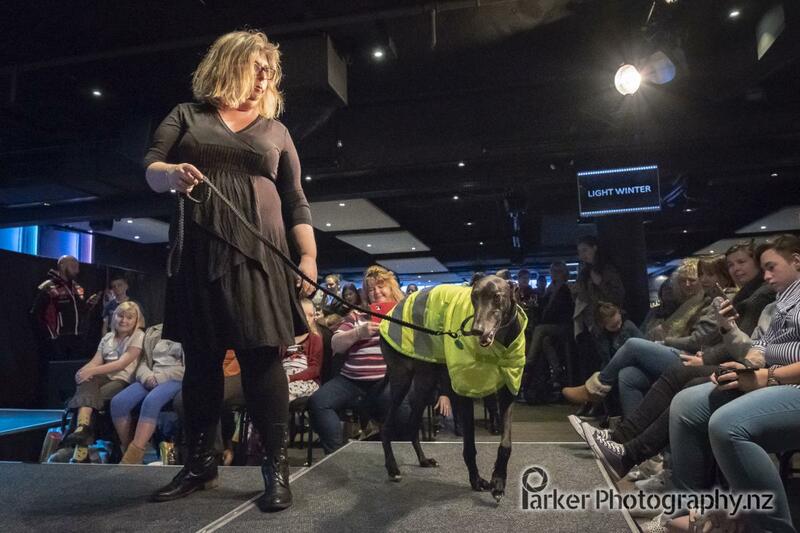 This greyhound fashion show was held to celebrate one of the more unique aspects of owning a hound – their clothing. The show was sponsored by local dog massage and rehab therapy practice, The Balanced Dog. Kathleen Crisley, the company’s founder, owns Izzy who was adopted through GAP. Comparing notes with my other hound-owning friends, it seems we all get stopped on the street to be asked about our hounds on a regular basis. This increases during the seasons when they are wearing clothes – raincoats, fleeces or snoods. Let’s face it, a hound in a coat is just too cute to pass by! I had the idea of a greyhound fashion show fundraiser for almost two years. My friend Marie Southwood, GAP’s South Island Adoptions Coordinator, acted as a useful sounding board for the idea and helped to find the venue for the show. She’s also my go-to person for sewing coats and knitting snoods for Izzy. Recruiting hounds and handlers for the show started early (in January) to ensure people could commit to the date and, because of workplace health and safety requirements, all handlers were required to sign a volunteer agreement. For the most part, I selected dogs that I knew had event experience since dealing with the crowd and the new environment of the nightclub would be something they would need to take in stride. But it was the owners who told me what garments their hounds owned and what they’d like them to wear in the show and we built the show around that. I scripted the show along the lines of a show at Fashion Week. We had collections for Rainwear, Early Winter, Deep Winter, Knitwear & Snoods and Summer Wear. And because my handlers were so enthusiastic, I couldn’t fit every outfit they had for their hounds in the structure so I added a Take a Bow (Wow) segment at the end which was handler’s choice as to what (if anything) their hound wore on the runway. We promoted the show consistently in the two months running up to the date and we were pleased to see the show featured in Avenues Magazine, on Stuff, and on Newshub’s Gig Guide on the Friday night before the show. The event had wide appeal and so we had greyhound owners, dog lovers, families, and product sponsors all represented in the ticketing line. Advance purchase tickets were encouraged to help us manage the crowd on the day. Everyone received a lucky dip prize ticket upon entry with the option to purchase more. The day itself passed in a bit of a blur for me, since I also emceed the show. But as I’ve said to many who have congratulated us on the results, Greyt Fashions was a team accomplishment. From Paula Cagney, who supplied me with greyhound photos that I used for the promotional image and flyer, to the person who photocopied the flyers, to the kid who helped sell raffle tickets, the husband who acted as bodyguard for the silent auction and prize raffle tables, the two ladies who stood out at the front and helped to sell tickets, the handlers with their hounds, and the photographers who took photos for free, this village of greyhound lovers really pulled out all the stops for GAP.